These metal cabinets provide safe storage for labs and classrooms. Standard Cabinet Shelves Hold up to 200 lb. Jumbo Cabinets Hold up to 400 lb. These sturdy metal storage cabinets are available in four sizes to meet your lab and classroom needs. The cabinets feature two swing-out doors with 3-point locking mechanisms that ensure safekeeping of the cabinet’s contents. The doors are reinforced for strength and quiet operation. The four shelves inside the cabinet can be adjusted up or down in 2" increments, so you can arrange your stored items as needed. The cabinet’s two adjustable front levelers keep it level on uneven floors. 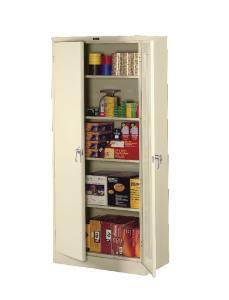 Standard Cabinet Shelves hold 200 lb., and Jumbo Cabinets hold up to 400 lb. Ordering information: Please specify color choice when ordering. Delivery information: This ships fully assembled.